Arduino 101 with light and temperature sensors. Pet Activity Tracker was created so we could monitor our pet. We wanted to make sure animals were always comfortable and happy. 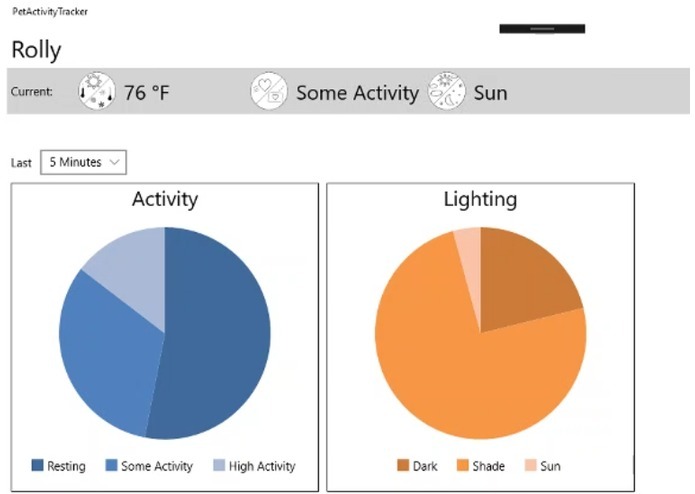 By monitoring temperature, light, and activity we can see how a pet is doing and compare current data with historical data. Pet Activity Tracker is a small device that is attached to your pet using a collar or harness. The device collects sensor data and transmits it via Bluetooth LE to our Windows 10 Pet Activity Tracker App. 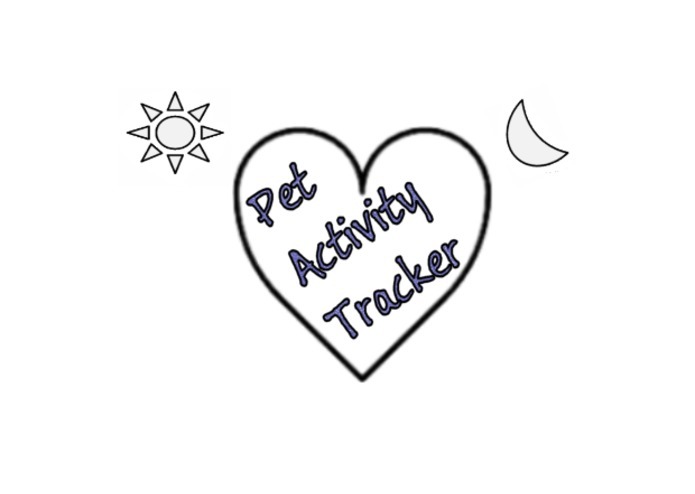 Pet Activity Tracker collects ambient temperature, tracks how much time your pet spends in sun, shade, and dark and records your pet’s activity level, including resting, some activity, and high activity. Pet Activity Tracker uses an Arduino 101 with the Intel Curie Module. We used the Arduino Windows 10 app to create a sketch file and upload it to the Arduino. 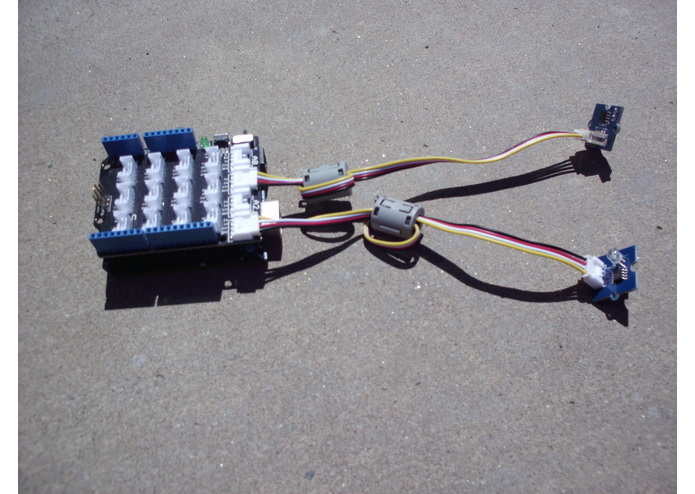 Our sensors include the Arduino 101 built in accelerometer and gyroscope, plus the Grove light and temperature sensors. We use the on-board Bluetooth LE module to send data to the app. 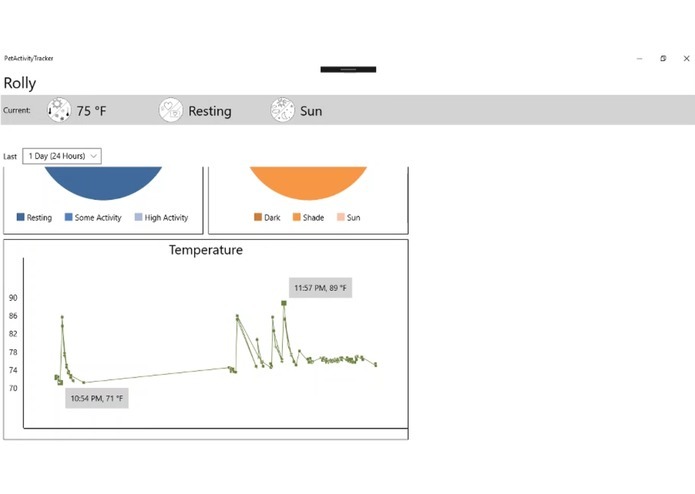 The Pet Activity Tracker App is a Universal Windows Platform app created with C# and XAML, using Visual Studio 2017. Before starting this project we had not used an Arduino before and it took some time to learn how to program it. It was also our first time using Bluetooth and getting the app to collect data was challenging. We have successfully created a device to track pet data. We were able to put the device on our dogs and get actual readings from it. We have learned a lot about the Arduino. We also learned how to transmit and receive data using Bluetooth LE. We have a lot of ideas to make Pet Activity Tracker even better. We want to support multiple pets at once. For livestock, such as cattle, we want to add a mode where each animal's data is compared with the average of the herd. This way individual animals acting differently than the rest could be identified. We also would like to use Bluetooth to track where an animal is on a pasture or large area by using some beacon or geo-fencing concepts. I worked on the Arduino 101, writing the code and integrating the sensors. I also did the videos and trained the dogs. I assisted with the Windows 10 app design and interface. I built the cloud services and worked on the client bluetooth connectivity. 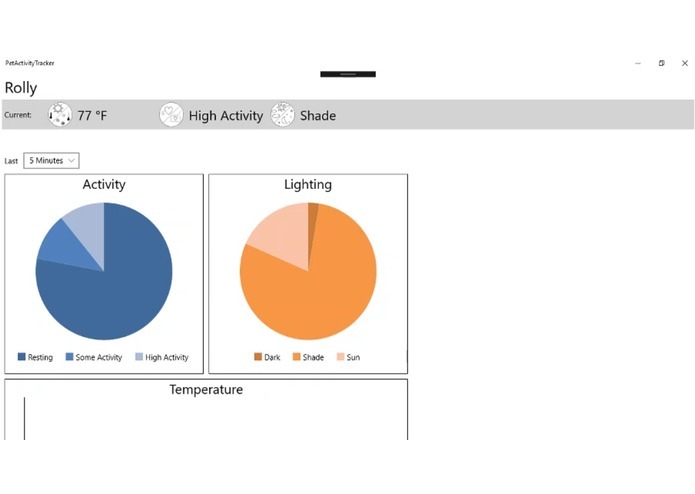 I worked on the Windows 10 app including creating the pie charts and temperature line graph.